Hay-on-Wye is a small market town in Wales close to the Wales/England border with a population fewer than 2000. These days it is probably best known for the Guardian Hay Festival which is held in May/June each year, runs for 10 days and attracts literati by the tens of thousands from all over the UK and around the world. Bill Clinton famously called it The Woodstock of the Mind when he attended in 2002, a quote the organizers have used ever since, of course. But when I spent a couple of days there in May 1983 (back in my Penguin Books days) it was known solely for its numerous second-hand bookshops (38 at last count) and indeed one of them in particular was, and I gather still is, the largest second-hand bookshop in the world. When I left, weary and slightly disoriented from too much browsing, much of it in musty rooms below ground, I had three large cartons of books, mostly dating from the 19th century, and the whole lot had cost me about forty pounds. Fortunately I was able to take them to the Penguin Books warehouse (then in Harmondsworth) where they were shipped back to New Zealand with the next container load of Penguin paperbacks. 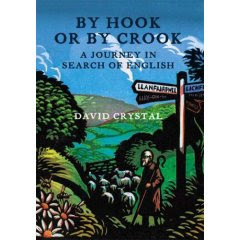 It was with a great sense of nostalgia then that I read chapter 6 of David Crystal’s altogether entertaining and diverting new title, By Hook or By Crook – a journey in search of English. Crystal is, of course, Professor David Crystal, OBE, one of Britain’s foremost authorities on English language learning & teaching, forensic linguistics, language death, language play, Shakespeare and lexicography. He is a widely published academic known for his editing of the Cambridge Encyclopedia of the English Language and other encyclopedias and for his 2004 book The Stories of English, a general history of English language. His says his entire career has been spent “trying to make valid statements about language and languages and about the English language in particular”. He has been described as “a latter day Dr.Johnson”. In his new book he bring an entertaining and often humorous Bill Bryson type of approach as he tours first Wales and then parts of England and Scotland recording and celebrating the range of present-day British English accents and dialects. The book is littered with bits and bobs of language lore and intriguing revelations. If you are searching for something that has been written in a book, you will probably find it in the second-hand and antiquarian bookshops of Hay. All you need is time, stamina, and a strong constitution. It is usually the lack of the last that lets you down. The symptoms of HBBS (Hay book-browser syndrome) are well known: sore eyes from too much title-gazing, torn fingers from too much page-turning, wobbly legs from too much haunch-sitting, and an inability to raise the head from a right-leaning neck-angle of forty-five degrees. It is fortunately a temporary condition, which for many people manifests itself during a visit to the ten-day Hay Literary Festival. His description transported me happily back 24 years to my one visit to the town. In his book much more on Hay, its bookshop and its festival, follows. towns and bridges and valleys and churches, and in fact almost anything where words appear. He is endlessly fascinated by things I suspect most of us would not even notice. When he comes across a small village in Worcestershire, called Bricklehampton, he is fascinated because he observes it has the longest isogrammatic place name in English. An isogram he explains is a word in which the letters turn up an equal number of times. In a first order isogram each letter appears just once: dialogue is an example. In a second order isogram, each letter appears twice: deed is an example. In a third order isogram, and they are very rare, each letter appears three times e.g. deeded (conveyed by deed). As I noted he is easily distracted. What is reinforced throughout is that language is in a constant state of change and I suspect that those New Zealanders who write to their newspapers complaining about the misuse of the language by young people with words such as random, sweet, hot, blues, mean, mint, genius, wicked and cool, would get little sympathy from David Crystal. He concludes his foreword by supposing his book might be called “stream-of-consciousness linguistics” and I think it is exactly that. I would certainly like to have been a student in his university English classes.